Garmin Forerunner 245 – Everything You Need To Know! The Garmin Forerunner 245 is set for release in Q2 2019. It’s the much anticipated update to the Garmin Forernner 235. Although the FR235 is still a great watch, it’s literally at the end of its life cycle. So… if you’re thinking about getting a GPS running watch, it might be best to wait for the Forerunner 245. It’s likely to be a very well-rounded running watch, with a palatable price tag. Rumours suggest that the FR245 will be released between March and May 2019. So April 2019 is a safe bet, but it could be earlier than that. Garmin will be releasing two different versions of the watch. So it’s safe to say that there is definitely a music version. You just need to be aware that the music version has the letter ‘M’ at the end of the product title. Will it have a round watch face? 100% yes. The Forerunner 245 will have a round watch face. Pretty much every Garmin watch set for release in 2019 will have a round face. This includes the Forerunner 45 and the Forerunner 945. Will it have a barometric altimeter? This is unlikely. The FR245 would be too close to the FR645 if Garmin were to include an altimeter. This isn’t a huge deal for road runers, but it’s worth keeping in mind if you’re a trail runner. An altimeter is a massive asset for trail runners, because it gives you better incline and decline data when you’re out on the trail. So, if this is a must have for you, the Forerunner 645 might be the better option. What about changeable wrist straps? More good news. Rumours suggest that the FR245 will have changeable wrist straps. This is likely to be one of the main differences between the Forerunner 45 and the Forerunner 245. Music playback is the other major difference between the two. Will you be able to pay for things with the FR245? Highly unlikely. Again, this would remove the need to upgrade to the FR645, which is Garmin’s premium running watch. So no, you won’t be able to pay for stuff with the Forerunner 245. What about open water swimming? The FR245 is a dedicated running watch, so we can safely conclude that you won’t be able to track open water swimming. This feature is also missing from the 645, so there are no surprises here. Can you use it for Triathlons? Nope. The Forerunner 245 can handle a marathon and cycle race with ease, but it isn’t designed for triathlons. Because it doesn’t have the ability to track open water swimming, there will always be a missing leg when tracking your activities in races. It also won’t have a triathlon mode, where you can seemlessly switch between swimming, cycling and running. Ok, so what features does the FR245 Have? I’m’ glad you asked. The simple tables below list all the (expected) core features. Then I’ve also added a table with all the features that the watch won’t have. This should make it easy to suss out if this is the right watch for you. 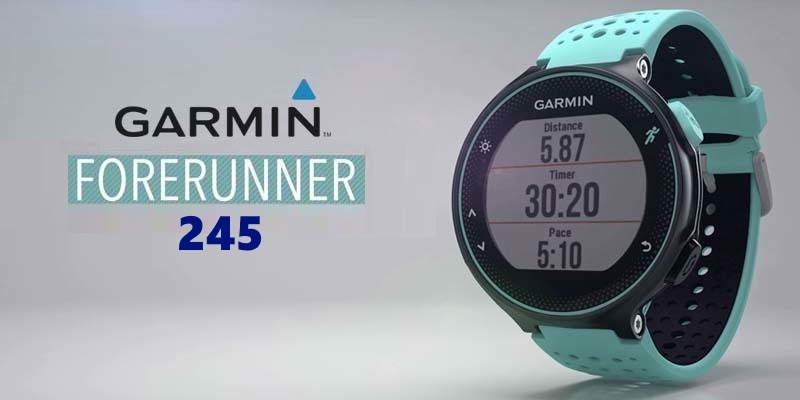 What Features Won't the Forerunner 245 Have? I’m just making highly educated guesses at this point. I would say that the FR245 is unlikely to have any of the following features. These features won't be found in the FR245. We’ve covered all the most important features of the Forerunner 245. These are 6 most important things to keep in mind. Garmin Chronos vs Fenix 5X – Which Is Better? Garmin Forerunner 235 vs Garmin Forerunner 735XT – Which Is Best for You? Garmin Forerunner 735XT vs Garmin Forerunner 935 – Which Is Better? Which Garmin Should I Buy in 2019? - 5KRunning.com on Garmin Forerunner 245 – Everything You Need To Know! Garmin Forerunner 245 - Everything You Need To Know! - 5KRunning.com on Garmin Forerunner 45 – Everything You Need To Know! 5KRunning.com is a participant in the Amazon Services LLC Associates Program, an affiliate advertising program designed to provide a means for sites to earn advertising fees by advertising and linking to Amazon.